In the spring of 2012 I found myself sitting in a classroom in Boston, Massachusetts. The air outside was filled with ice and the feeling of being in a warm greenhouse, holding tiny seeds in my hands was a memory. I had taken a season off from farming in order to go back to school and earn a graduate degree in Urban and Environmental Policy and Planning from Tufts University. Naturally, I was focusing my work on food systems policy and planning…and ironically it was the longest it had been in years since I had walked into the greenhouse to find soil-filled flats bursting with germination, worked the earth in preparation for planting, or succumbed to the cartoon spiral eyes farmers get when they flip through seed catalogues. Needless to say, it was a strange spring – thinking, researching, talking and writing food…but my farm, 3000 miles away, was nowhere in sight. It was during this brief sabbatical from farming, however, that I had some of my biggest farming “Aha!” moments. Sitting in that basement classroom in the middle of the city we talked a lot about soil erosion; about machine-intensive agriculture; about bare soil being washed away in post-tillage rainstorms; about bare soil being blown away in post-tillage windstorms. We talked about research that was showing how much healthier organically managed systems were; how much healthier low-tillage, strip-tillage and no-tillage systems were for the soil. We talked about the magic of leaving crop residue on the land, and how much that simple act reduced soil erosion. Of course, the no-till methods I was studying at Tufts were methods adapted for large-scale, industrial, commodity crop growing farming systems found most quintessentially in the Midwest. These systems often rely on seed drills for planting and chemical applications to manage weed pressure. These systems were not something I was hoping to emulate, but they inspired thought. Something to know about farming – you see so much. I’ve said this to many people – in a way, as a farmer I see the world like I did when I was a kid. The bugs, the worms, the snakes, the birds in colors you forget birds in Northern California come in, the lizards – my gosh, the lizards are everywhere – the creatures that we share the land with. When you see all of this you almost don’t even need the science (mind you, its there, I’m merely saying its only a piece of the puzzle). It is intuitive that putting that soil – the land – through a blender time and again can’t be the very best thing for it. And, intuition aside, the science does, in fact, support the notion that reducing tillage is better for the land. Places like the Rodale Institute have shown the benefits of low and no-till through longitudinal research. Less tillage means less erosion, less carbon released, higher organic matter content, more water holding capacity and higher yields. Less tillage leaves microorganisms to do their work, leaves soil and fungal structures in tact and allows habitats to persist. In these ways it is better for the environment and better for the farmer. The question was, how could I take this concept and adapt it to my diversified vegetable production in a way that upheld my values – that is, how could I adapt this model to something chemical-free? And how might this drastically change my farm? You see, currently we are blessed (considering the drought) with being situated on a small parcel of land that sits very low in the landscape. I do not typically have to begin irrigating until late June or July…in non-drought years it has been as late as August. There are photographs of our long-passed neighbor in a row-boat out in the back of our field one winter some 75 years ago. Admittedly, it is no longer that wet, but it is wet. Consequently, I have a great photo montage from my first few years of farming of (many) stuck tractors, immobile in the field, as late as mid-June. Not only did no-till methods sounds promising from a land-management perspective, but omitting a reliance on tractors would be an incredible boost to Red H Farm’s spring production capacity. I toyed with ideas of strip tillage, relying on a simple push mower to keep the pathways clean. 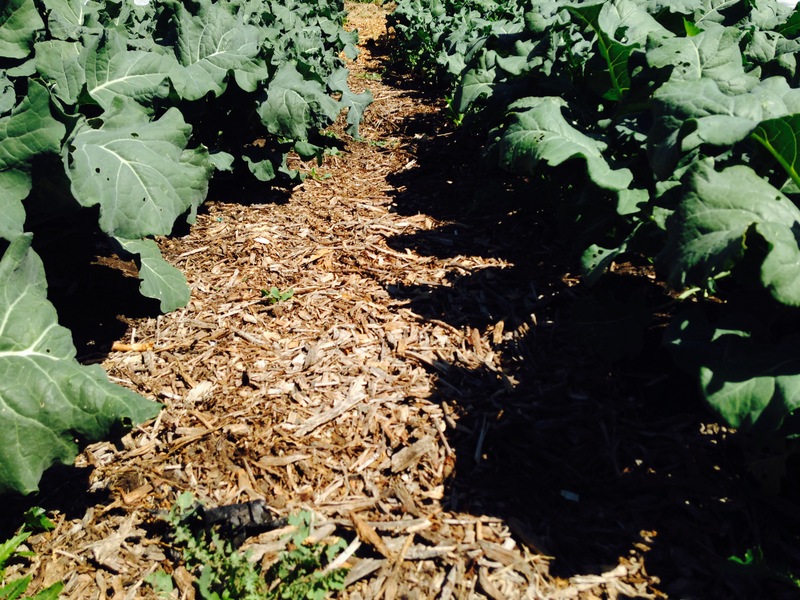 I considered doing a rotation back and forth – straw-mulched pathways one year could be raked back to create beds the next year, while the first year’s beds would them become the pathways, and so on. Then on my trip home over Christmas break that first winter I borrowed my brother-in-laws truck and bought a yard of Vineyard Mulch from Sonoma Compost. I covered a small area in the front of the field with it, a couple of inches thick. When I came back in the late spring for a few weeks, I discovered I’d need a hell of a lot more mulch, but that where it was thick enough to suppress the weeds the soil was soft and perfect and I was able to stick my hand straight into it to quite a depth, easily. It was ready for immediate planting. Amazing. Of course, I had to go back to school, but the ideas percolated and I had a new and changed vision of what kind of farm I would build when I came back. When I returned and as the work got underway, I learned about other farms in the area that were implementing similar ideas – farms like Singing Frogs Farm and Handlebar Farm, both in Sebastopol. It seemed to be a viable plan. 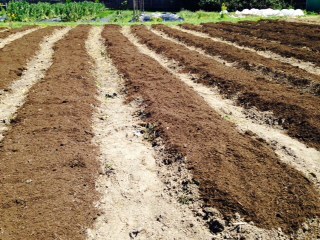 The method I employ consists of creating permanent beds right in the ground, applying a compost layer to each bed that suppresses the weeds. For the pathways I work with local tree trimmers (and by work I mostly mean that I run after their trucks post-tree trimming and wood chipping, waving my arms and offering the farm as a dump site for their load), in an effort to save money, re-purpose local products and create an environment for thriving mycorrhizae. I also use straw and when I can’t get my hands on enough product, a wheel hoe, to manage pathway weeds. The land is getting slow-release nutrients from the compost, and increasing organic matter as the pathways decompose over time. 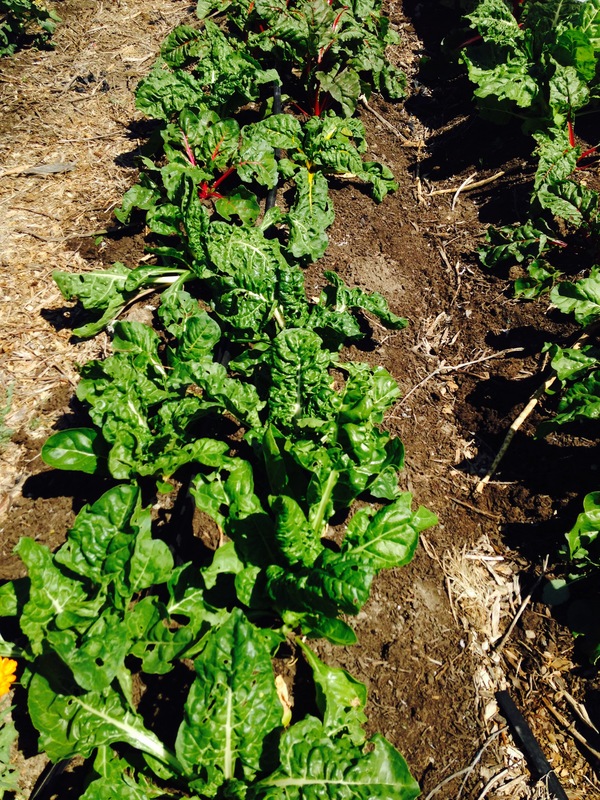 My overall goal is to apply mulch and compost layers that are thick enough to suppress weeds, while being thin enough to encourage plants to root deeply into the beautiful sandy loam soil that we’re blessed with at the farm. Dare I discuss the terroir of my vegetables? It is still a massive work in progress – this is a truly bootstrap operation after all. There is no tech money or family money or angel investor money or ex-banker money or pot money or, well, money of any kind really. Just good old fourteen-hour-a-day sweat equity (mine and that of enlisted family members – Mom and Dad and brothers and sisters and nephews when I can lure them out to the fields) and CSA subscriptions and farmers market sales. We’ve converted about 2/3 of the farm, and are hoping to make further strides this season. Its an expensive process, but in the end increases productivity and saves money that would otherwise go to machinery, gas, and hand-weeding. It creates a beautiful landscape that is reminiscent of a giant garden rather than the traditional image of a farm. It means I spend my time hauling and dumping compost (which I love) more than I do weeding (which I loath). Not to mention all those environmental benefits.